An Evaluation is a systematic determination of a subject’s merit, worth and significance, using criteria governed by a set of standards. A thorough building inspection by an experienced, knowledgeable inspector with the addition of an Infrared Evaluation will provide you with the absolute most information that you can get when purchasing a house or building. Before I continue, please understand that the most important thing with Infrared is the training that the user has had. IR camera prices have plummeted. The camera I spent 10 grand on 15 years ago can now be purchased for less than 2 thousand. There are even apps and cameras that can be attached to phones now. With low prices, more people are getting into Infrared and the number of companies providing “Certification” has exploded. Most of which aren’t worth the paper they are printed on. I’m a Level II Thermographer. That means I’ve spent two solid weeks in intensive courses involving building science and Infrared science. Followed by exams with only a 50% passing rate. When inquiring about Infrared, the first question to ask is “What training have you had”. I suggest that you don’t choose the one with a 4 hr, one day or two-day infrared “Certification”. Indeed, most of these inspectors are giving Infrared a bad name by providing disinformation. 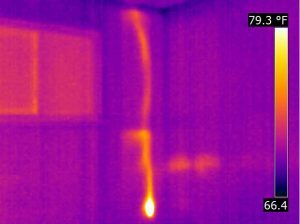 The Infrared camera enables me to see things like moisture intrusion, structural and electrical defects, heat loss and missing or failed insulation that the naked eye can not see. Defect recognition or problem detection is about gathering as much information as possible, in as short a period of time as possible, to make an informed and accurate decision. Infrared gives me information that assists in achieving that goal. Simply put the Infrared camera views and records things that the human eye can not see. 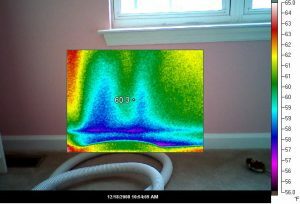 Infrared thermography has been around a long time but it has only become reasonably available as a home/building inspection tool in the last few years. It enables me to see heat energy in the form of electromagnetic wavelengths. Wavelengths that aren’t visible to the human eye. Thermography is the art and science of detecting, displaying and recording the thermal patterns and temperatures across the surface of an object. Any object that has a temperature above absolute 0, or -460 degrees Fahrenheit, will emit infrared (IR) energy. The thermal imager (camera) converts emitted energy into visible light that I can see on the camera’s screen and record. Using my training and experience, I then interpret what is visible on the camera’s screen and explain/report it to my client. That’s about as technical as I’m going to get here because I don’t want to lose you. 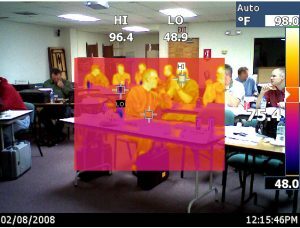 However, as a Level I certified Thermographer, I need to understand the science, have adequate training and have building/inspection experience in order to accurately interpret what the camera shows. IR has many, many uses and more are being found all the time. 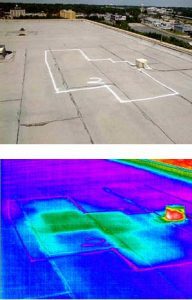 It’s ideal for any situation where knowledge of thermal patterns across a surface will provide meaningful data about a structure, a process, or system. IR usage ranges from military & law enforcement to detecting soft tissue injuries and breast cancer, to weather forecasting, and to building diagnostics. As a building diagnostics tool, under the right conditions, it can show structural defects, electrical hot spots, leaks, missing insulation, moisture penetration, heat loss, and a whole host of other potential building problems. And it’s a completely non-evasive, non-contact, non-destructive, way to see these things. It can be performed remotely, measure temperatures and record the data. It is especially good at assisting in energy evaluations. The photo below shows the electromagnetic wavelengths emitted by the persons in a seminar I took. Note: the low temperature, 48.9 degrees, within the viewfinder is a cold drink on a table. The high temperature, 96.4 degrees is at a man’s mouth. Perhaps he had a recently had a sip of coffee or a smoke. The IR camera I use enables you to see the Infrared view inside the visible light view. It makes it easier to understand what you’re viewing. Many times, with a photo that is entirely Infrared, it is difficult to understand what you are looking at. Moisture Intrusion / Leaks! From improperly detailed exterior siding. 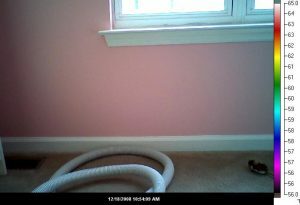 The IR camera can allow me to see where moisture is entering a house. The visible light photo below shows a section of drywall below a window sill. Viewed with our eyes, there are no visible problems. The photo below shows the same area viewed with the IR camera. The blue area may indicate moisture intrusion. Something is not right. I recommended and the owner gave permission to do a destructive investigation which included first drilling several small holes to allow access for a probe-type moisture meter. The moisture meter confirmed elevated moisture levels in the wall cavity. 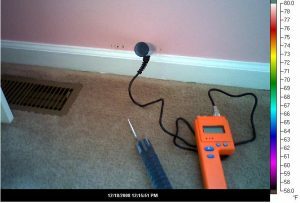 The photo below shows the small holes drilled in the drywall and the probe type moisture meter inserted into one set of those holes. However, knowing how difficult it is to get builders to agree to anyone’s findings, I suggested, and the owner approved, cutting a hole in the wall so the area of concern could be better accessed and viewed. 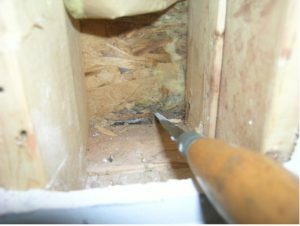 The photo below shows the hole cut in drywall to access the area. This gave even better access for the probe type moisture meter. The photo below shows what was visible when the insulation was moved aside. The back or interior side of the OSB / exterior wall sheathing was wet to the touch and showing signs of deterioration and mold growth. If there is an electrical problem it nearly always shows itself as excessive heat. This makes the IR Camera ideal to locate/see electrical defects. Again, these are almost never visible to the human eye. Only the IR camera can see them. 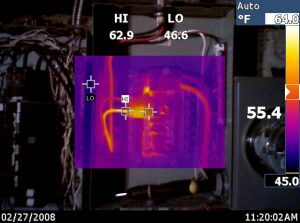 Additionally, only an experienced inspector can determine if the heat shown by the camera is acceptable or not. Below is a photo of the interior of an electrical panel. The reddish/yellow in the center shows a breaker that is overheated. 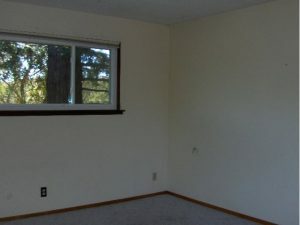 The photo below shows visible view if the inside of a bedroom. Typical, walls, ceiling, floors, window. Note the outlets below the window. No “visible light” concerns here. The photo below shows the IR view. Note the yellow/red line that goes down from the ceiling to one of the outlets (visible in the photo above). This is an overheated electrical circuit and outlet and a fire and/or an explosion waiting to happen. Thermography is a non-invasive diagnostic technique using an infrared (IR) camera to photograph and measure temperature variations on the surface of a material. I can help roofing contractors work smarter and be heroes to their customers by pinpointing wet, failed areas of commercial roofing. Repairs are cheaper and faster than replacement. New roofs or overlays are nearly always installed over defective, wet roof insulation that can take up to 100 years to dry out and the energy lost at the defective location must be considered. The photos below are from an inspection that was done at night. This inspection is generally is a two-day process. What you see in the bottom photo, is wet areas of insulation under the section of roof that is leaking. The top photo shows the roof marked to indicate where the problem was found. The photo below was a walk-under inspection of the same area, where moisture was evident / found with the IR camera. This inspection should be done in the morning when the roof is beginning to warm. It can be accomplished under virtually any weather conditions. 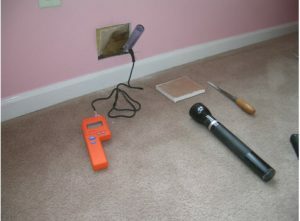 Is IR a home inspection tool. Yes, and No.